Ronnie got me two knife sharpeners that I've been needing.....Santa (me) got him a couple of Wusthof knives for us (me lol). 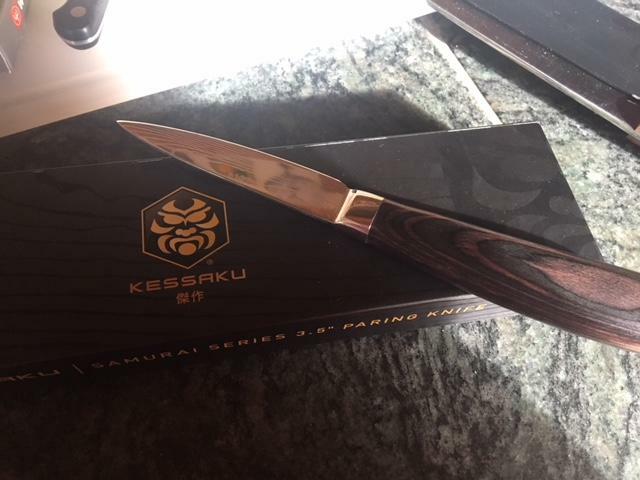 And my mom and step dad got us two GORGEOUS knives--one is Messermeister by Virgina Boys Kitchens and the other a Kessaku! Then I got Ronnie the Bison fire starter--and he got me the torch. But who got you the first aid kit? I got a big tube of Flex Glue in my stocking...that will have to suffice. That or there is always Duct Tape! Add me to the offset spatula club! And a regular metal one, and a regular plastic one. A bigger pie server. A jar-opening thingy, and a bottle-opening thingy. And a widget that has a clear cup on bottom an assorted attachments on top including a juicer, a ricer-type thing they call an egg shredder, and I forget what other attachments. Cool widgets! Hubby got me this new Oxo kettle to replace my old one. 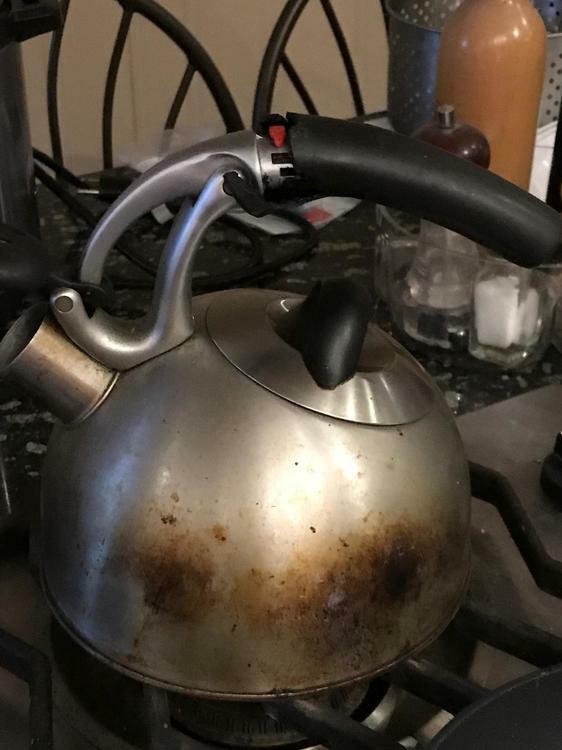 I suspect it's as much for him as for me as he's tired of burning his hand on the handle of the old one - it hasn't given up the ghost entirely yet but of course he uses it more than me making me my tea in the am). I realize he isn't aware of the replacement I already have waiting in the wings for when it really does pack it in (it's been the closet for a couple of years now). He did the research and apparently decided that this version was better than the other Oxo version (the one I have in the closet). See - not dead yet - but I guess I'll have to bin it now. Remember now it’s the thought that counts! 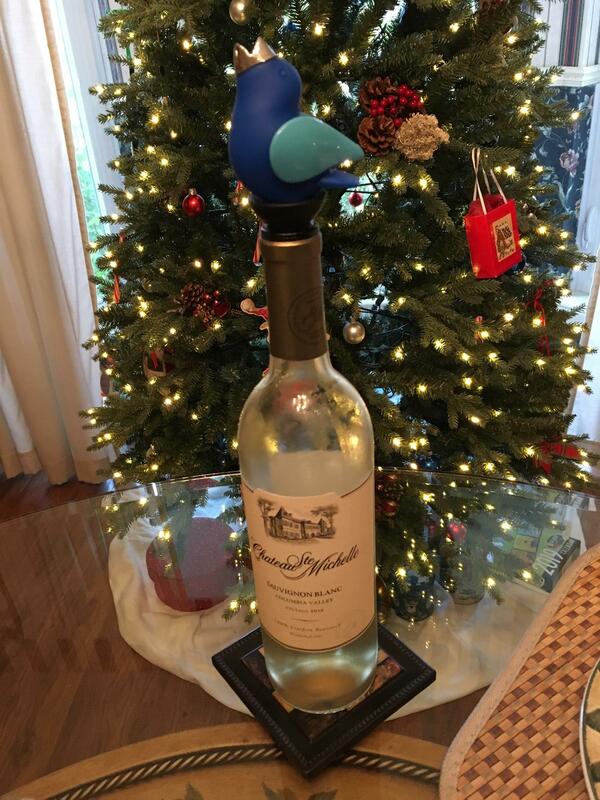 Chirpy Wine Pourer - Gifted to me by one of my Birding friends. The pourer chirps when the wine passes through! 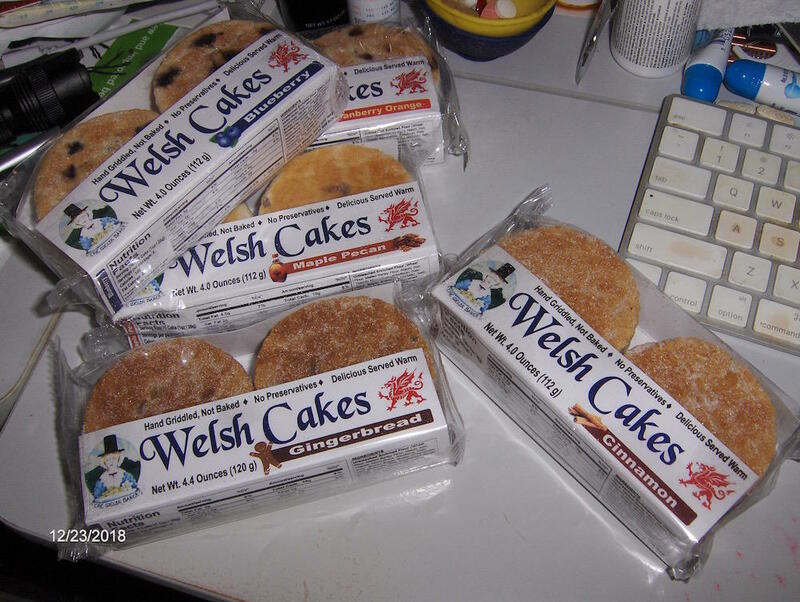 I got a selection of Welsh Cakes from a very dear friend. They are quite tasty, just right for a snack with tea. 6 packages of 4 each, different flavors. I have frozen all but the lemon poppyseed that are not shown. There are only 5 in the photo because one slid off my desk and I didn't feel up to crawling under there to retrieve it. Fortunately my Basenji dog does not care for such things. This is from a SoCal local vendor - actually closer to me than to my friend who lives in Orange County, but she discovered them a couple of years ago and I have been a beneficiary of her gifting for 3 years in a row. I was sitting yesterday, pondering what to drink with my oysters as a starter for dinner, when my phone rang. It was a delivery guy saying he was downstairs with my package. I wasn't expecting any package, so was somewhat intrigued. Sure enough, he had a package fro me, which a friend had couriered from Shenzhen where she lives. 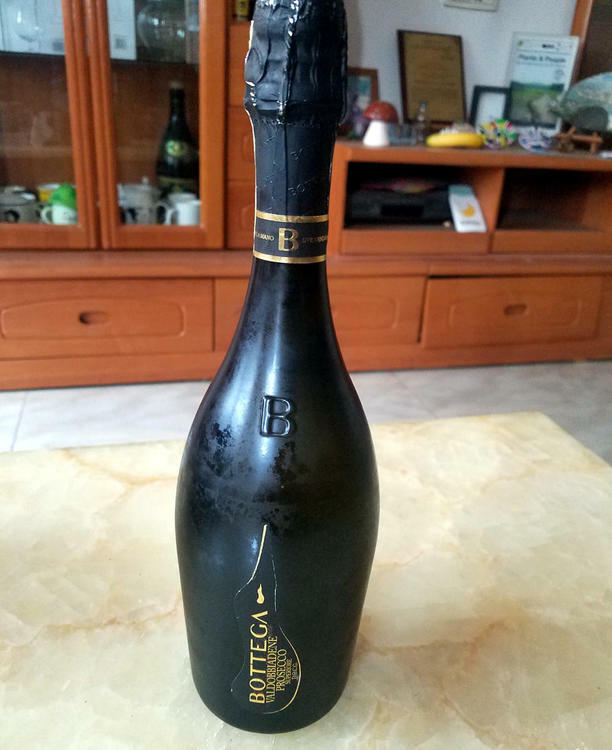 Said friend carried this back from the vineyard in Italy to China for me and timed the last stage of the delivery perfectly. And very good it was, too. The usual assortment of snacks, a bottle of frangelico for hazelnut truffles and brown dishtowels for chocolate work - those were requests. 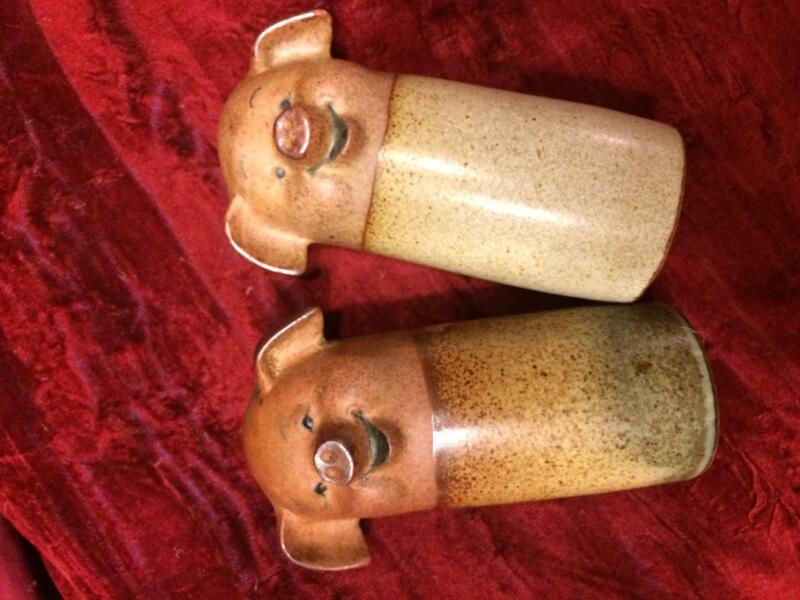 And my sister found these cute S&P shakers on eBay - I’m year of the boar and my favorite meat is pork, so I have a little collection of pig things to add these to. My mom's been collecting piggies for years, but has had to stop because her little apartment has only so much space. So this year I had an inspiration, and bought her a calendar with pictures of cute little teacup pigs from some farm down in the US. That way she gets her piggie fix, but doesn't have to use up one of the few remaining flat surfaces in her living space. This year I hope to take her out to the boar farm I used to buy from when my restaurant was open. The only thing cuter than an avalanche of happy, squealing, playing piglets is a that same avalanche made up of dappled, fuzzy boar piglets. My oldest daughter gave the cutest chicken-themed kitchen gifts!! The first a ceramic chicken, about 6" high, with the top-back cut out, and it holds measuring spoons. 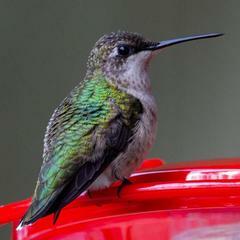 The spoons function as a tail, when the scoop-end is pointing upwards. Darn cutest thing ever! She also gave me a journal-with goofy chickens all over it. My son gifted me with a huge, fancy Oster blender. ( I used to make him smoothies before work some mornings, so perhaps this is a hint.) Hubby gave me a new immersion blender. I gave myself a couple new dishtowels. A large goofy sheep, with the caption, Fleece Navidad. My youngest daughter gave me a selection of food-themed hand soaps. So you can wash your hands anywhere in the house and end up smelling like fruit salad or baked goods! hahaha! 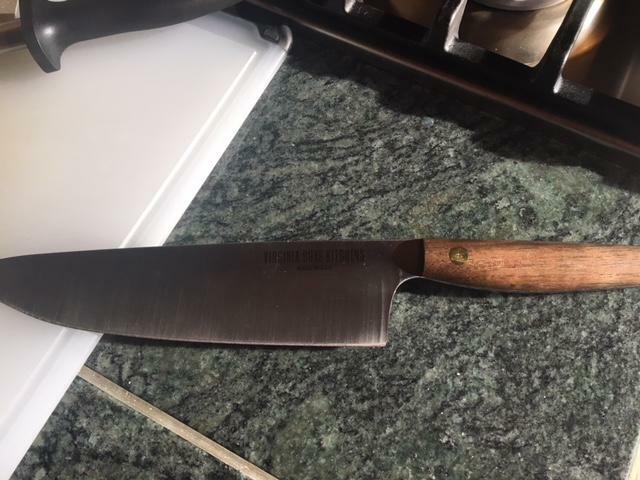 From my brother: a Victorinox boning knife, a rack to stand pot lids up in, and an entire case of the disposable gloves I wear while preparing meat or seafood. From my sister, a bottle of very good champagne. From my teenaged niece, a tin of homemade cookies. From my parents, a gift card to an amazing cheese shop near me https://wasiks.com and a beautiful serving platter. From my husband, a new camera (Canon 5D) to use to take pictures for the Dinner! thread. Very nice gifts and I’m sure they are well deserved. Just kidding about the photographs but I do think yours are gorgeous. I lust after both the gift card AND having an amazing cheese shop nearby. Our superKroger has what contends it is a branch of Murray's, with a fair selection of cheese, but it's a long way from an "amazing cheese shop" unless all you've been in is the grocery store cheese counter. I do not suppose I will ever forget the fresh mozzarella I had from the Italian Market district in Philadelphia, in a tiny shop that sold nothing but fresh mozzarella. My daughter is presently in Rome and posted a photo of the caprese she had for lunch. I cannot fathom that the mozzarella is any better. That's my complaint about living up here in the "high" desert where we have a winery with a minuscule "cheese case" the cheese section at Trader Joes, which is half an hour from me, and otherwise not much. When I lived "down below" in the San Fernando Valley, there were a couple of modest cheese offerings, Whole Foods, Bristol Farms and Trader Joes but I was also in easy driving distance of The Cheese Shop of Beverly Hills which was like a trip to Nirvana - More expensive. I would lock my checkbook and credit cards up at home and take ONLY CASH so I would be limited in what I could spend. I had gone there often enough that they understood and were very nice. One gentleman was so nice about giving me samples to taste. I told him that I would never be able to afford to actually buy a significant amount of the very expensive cheeses but he said not to worry, it was enough that I truly appreciated the product. I was quite frugal but bought some really fine cheeses. At times I was able to splurge a bit and that was fun. I always waited for that man to serve me. I often found something extra in my bag when I got home. I was just gifted two racks of home-smoked ribs! I've had this friend's ribs before and they are spectacular. Good ribs are one of my favorite treats, and something I will probably never make for myself. I got another gift certificate for Quattros' Farm Store in Pleasant Valley,NY. I used up 2 and 1/4 of the ones I already had for German style potato salad, some Ewe's blue cheese, some ox bones for stock, ground venison and part of a venison backstrap. Unfortunately I didn't see any pheasant so will have to ask if they are harvesting any in the near future so I can make parmesan and stock. I got John a bunch of jellies, jams and honeys from our travels and found this cute thing that is a citrus knife and bottle opener that will not damage the counters. Since my mom passed earlier this year, Christmas was at my brother and sister-in-law's. We all prefer gift cards but my s-i-l insisted on continuing one of my mom's traditions which meant everyone had to have something to open from under the Christmas tree. I got this "X-Chef Silicone Pastry Brushes - Set of 4". I bought it myself and gave it to my brother to wrap. Nice way to get what you want on Christmas. What a thoughtful gift. I love that. Most of our friends are at the age that they don’t really need anything so similarly I made 18 egg yolk pasta for everyone and put in fancy tins. Chucked them in the freezer until it was Santa time. Everyone was very happy. yeah we do the same but last year I realized I really do have to check WHAT they might like. I spent about 6 months doing a counted cross-stitch magnet of a Cotswold cottage for mother-in-law #3 as my in-laws love the area. Unfortunately I forgot about my father-in-law's predilection for no clutter. She didn't realize I had actually made it and he threw it away. That is horrible. On a lesser note I had given one of my chocolate bars to a kind patron. 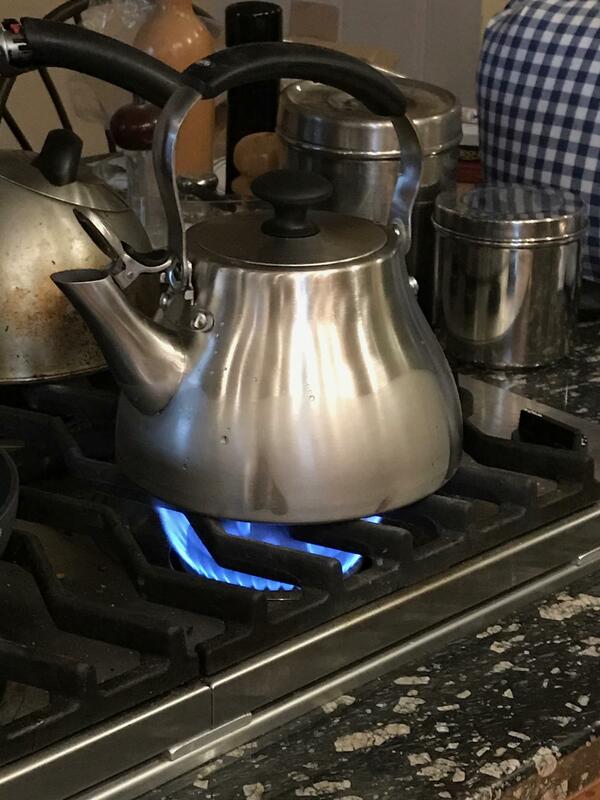 He is an artist and his wife is a baker and craftsperson. They do their parts for keeping our lobby decorated and our circ numbers high. Last night he apologized that he did not realize I had made it. He said it looked too perfect not to be commercial. One of my colleagues must have set him straight. 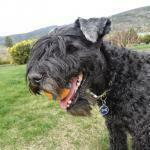 Fortunately he had not thrown it away.